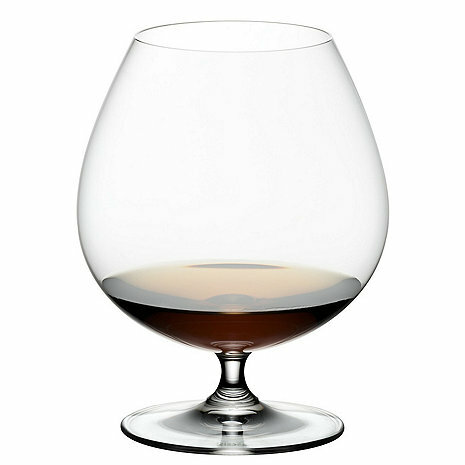 Riedel Vinum Brandy Snifter is the perfect glass for swirling, sniffing and enjoying fine brandy. The shape of the brandy glass concentrates the nuances of the bouquet, while the round wide bowl allows you to cup the wine and bring it to the right temperature. The exquisite crystal brings clarity to the rich hues of the brandy. Is this set of 2 Riedel Vinum Brandy Snifters the same glassware as the one that is included in the Brandy Warmer 4-piece Gift Set? No, these are two different glassware sets. Can the Riedel Vinum Brandy Snifters be used in the Brandy Warmer? if you want to purchase both, you actually can use the Riedel glass on the warmer too. I have not done that. Looking for a glass for after dinner liqueurs like schnapps, Grand Marnier, and cognac. seems you have a different glass for the cognac. Can you tell me why? BEST ANSWER: I got the brandy snifter because of the large bowl which allows the bouquet of the cognac/brandy to open up and fill the glass plus the large bowl allows you hand to cradle it from below and the heat of your hand warms the cognac and the heat opens up the bouquet. The shape and size of the glass enhances the aroma of the cognac. Remember that cognac is distilled wine. Try it, you will see! I use this product for brandy and non-XO Cognac. It's bowl is just the right size to smell the brandy as you are sipping it and/or right before you sip it. The glass is very beautiful and compliments my other Reidel glasses. I am returning as defective. Both glasses have slight flaws, like small bubbles in the glass and one has a distinctive sharp bur that irritates when the glass is held. This product is perfect! I use it for my Belgian pale ale, and it's wonderful to hold and sip lightly from. Buy this product, you won't be disappointed! The shape and size of these glasses provide the perfect nose to the orange compliments in Grand Marnier. Excellent product. Great service and delivery from wine enthusiast. I bought this product as a gift for a friend. Intending to supplement my same-size snifter set, I was surprised to find these much larger than my others. Make sure you check the size before ordering. Otherwise, excellent vessel, just not as useful as expected. You could really smell brandy - which is sooo good! Just love it! On time shipping and super safe! Present for my husband and he loves them. Great addition for his new bar. Both broke within 10 days: one while HAND wiping, one when knocked over.